In the famous novel A Christmas Carol, the main character Ebenezer Scrooge is visited one night by three spirits that eventually lead him to having a spiritual conversion of sorts. What few people know is that the author of that book, Charles Dickens, claimed to have had a nighttime spiritual encounter of his own. And who was the supernatural visitor? It just might been the Blessed Virgin Mary. 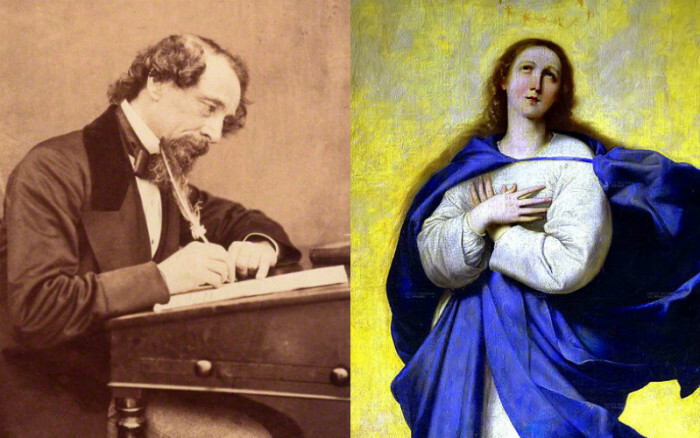 Dickens was no fan of Catholicism (or evangelical Protestantism, for that matter), seeing only hypocrisy and a lack of faithfulness to the true teachings of Christ. Then, one dark night in 1844, he had a strange supernatural experience. In the midst of his sleep, he says he was visited by some sort of spirit. The spirit had the form of a woman and was draped in blue as, in his own words, “the Madonna might in a picture by Raphael.” He didn’t recognize the person, and the figure said nothing, but simply looked at him with deep compassion. Finally the woman answered: “For you it is the best!’ Suddenly, she vanished, and he awoke with tears streaming down his face. So who was the woman? At least publicly, Dickens speculated that the woman was his aunt Mary Hogarth, who had died seven years earlier and to whom he had been close. But in his own recounting of the vision, the woman “bore no resemblance to any one I have known except in stature.” So that doesn’t seem to make much sense. The fact the woman didn’t identify herself makes it harder to determine her identity with certainty. But several details from the story – her blue clothes, look of compassion, and insistence he become Roman Catholic – make it seem fairly likely that, if this was indeed a real vision and not just something of his imagination, he was visited by none other than the Blessed Virgin Mary. Let me tell you of a curious dream I had, last Monday night; and of the fragments of reality I can collect; which helped to make it up… In an indistinct place, which was quite sublime in its indistinctness, I was visited by a Spirit. Then I awoke, with the tears running down my face, and myself in exactly the condition of the dream. It was just dawn. What do you make of Dickens’ experience? Let us know in the comments!